The Present study was designed for the estimation of essential trace element Calcium in drinking water from natural sources like well, bore-well and river (Tapti) of Bhusawal (Maharashtra) (21.0455° N, 75.8011° E). Samples were evaluated as per Bureau of Indian standards 10500 for Calcium, Concentration of Calcium in water samples of River, well and Bore well was found within the safe limits of World Health Organization guidelines for Calcium and also study finding suggest that well is the better and rich source of Calcium as compared to Bore Well and river and population residing in the region and consuming water from well would be less prone to Calcium deficiency and risks associated with it, as compared to Population consuming water from other sources like Bore well and river. Calcium is the most abundant essential trace in the human body, making up about 2% of the total body weight [http://healthyeating.sfgate.com/role-calcium-bodys-nutrition 1265.html]. The main role of calcium in the body is to provide structure and strength to the skeleton. In the earliest forms of exoskeleton and in shells, the structural rigidity is generally provided by calcium carbonate. In vertebrates such as reptiles, fish, mammals and humans, the structure of the skeleton is mainly provided by a form of calcium phosphate called hydroxyl apatite crystals, which are found in collagen. Calcium ions on bone surfaces interact with those present in the bodily fluids, therefore enabling ion exchange, which is essential in maintaining the balance of calcium in the blood and bone [Underwood, 1971]. Calcium is a mineral that is an essential part of bones and teeth [FAO and WHO, 2001]. The heart, nerves, and blood-clotting systems also need calcium to work, Calcium is used for treatment and prevention of low calcium levels and resulting bone conditions including, rickets, osteomalacia and osteoporosis[Prentice, 2007]. Calcium is also used for premenstrual syndrome, leg cramps in pregnancy, high blood pressure in pregnancy [https://www.webmd.com/women/guide/what-is-pms#1]. Calcium carbonate is also used as an antacid for “heartburn” [https://www.webmd.com/heartburn-gerd/default.html]. 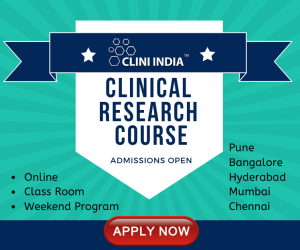 Hence the overall objective of the present study is to quantitatively estimate the amount of essential trace element Calcium in the drinking water [WHO, 1993], to ensure the required and safe levels of Calcium in drinking water to fulfill the daily requirement of body as per Bureau of Indian Standards Specification from different Natural sources such as river (Tapti), well and bore well. Different sources such as river, well and bore well of Bhusawal (21.0455° N, 75.8011° E) region was selected for study. Water samples were collected with utmost care to ensure that no contamination occurs at the time of collection or prior to examination. Closure was removed with care to avoid contamination and held near base filled with water without rinsing and closed immediately. Plastic bottles of 1Litre capacity were used for trace element determination, washed with nitric acid (3%) rinsed three times with distilled water, dried and filled with water leaving no air space and tightly closed with plastic closures to prevent any leakage. Each container was clearly marked with name and date of sampling. Sampling from well and bore-well: To the discharge tap of mechanical pump fitted to well or bore-well, rectified spirit was applied and allowed to dry before collection of sample, Water was pumped to waste for four to five minutes and then flow was restricted to permit filling the bottle without splashing. Evaluation of water samples was carried out as per Bureau of Indian Standard 10500 for safe water quality parameter of Calcium (Drinking water specification Indian Standards 10500:2012). Concentration of Calcium in all water samples were found within the safe limits of World Health Organization guidelines and Concentration of Calcium was found high in water samples of well of Bhusawal (21.0455° N, 75.8011° E) region. 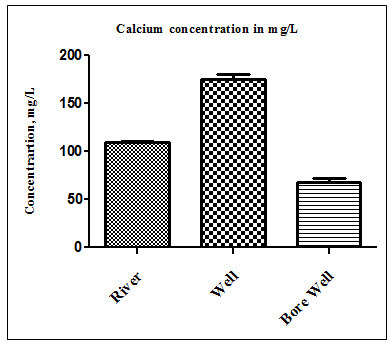 Table No.1: Concentration of Calcium content in water samples of well, bore-well and river (Tapti) of Bhusawal region. Figure no. 1 Concentration of Calcium in Water samples of River (Tapti), well and Bore-well of Bhusawal region.